Do you remember those Nokia phones where you will create your own personal ringtones and then add vibrations as you pleased? Did you ever wonder if it were possible on Android? It is true that while many of us don’t really like to leave the cellphone on vibrate, rather most of us don’t want the phone to vibrate, this particular application might change all that for you given the fact that it makes cellphone vibrations so much more fun. 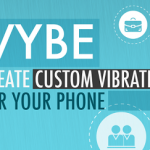 The application goes by the name of Vybe which is a simple concept of creating your own unique vibrate patterns. Nokia C3-01 is a second Touch and Type Device after the announcement of X3-02 Touch and type, its a successor of Nokia C3. Both of these phones shall be released under Symbian 40 platform. So, now its apparent that Nokia World 2010 was not all about Symbian^3 but they do seem interested in launching phones on previous mobile operating systems, however, its good that Nokia has been introducing hi-tech and highly demanded features in their upcoming handsets on previous platforms. C3-01 Touch and type was announced earlier in September, 2010 and is said to be released in 4th quarter of 2010, which is little after the release of X3-02.